When you combine the convenience of modern-day telephony with the power of data – that is, computers, the internet and all the information you can from it – you get the power tool that every business should have. That’s what Computer Telephony Integration is all about. This integration is your key to a better performing sales team, increased revenue and efficient customer service. As your legacy, premise-based phone system reaches end-of-life and you have to explore your options for a new system, it’s important to identify the most important features you need for your business to be competitive. This technology is primarily used in call centres and is often used to describe desktop interactions that improve human agents’ productivity. Foremost when it comes to CTI functionality is its more efficient call routing. Here, skills-based call routing, automatic call distribution, interactive voice response (IVR) and other CTI functions are integrated with your client/ lead/ supplier database, and select business software, such as your CRM system. The result is higher quality interactions with your sales team and other call agents within your business. Calls are processed faster. And, callers are directly forwarded to people they want to talk to team members who are best qualified to respond to their requirements. The comparison of call origin against user/ client data is also a way to short-cut call processing. 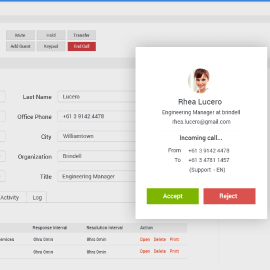 Instead of having your caller repeat their information to authenticate their account every time they call, you get automatic caller authentication through CTI integration. This not only saves your sales rep or agent some time. It can also mean less frustrated callers. This feature enables users to search your corporate directory from the handset, making it quick and easy to find an internal contact and dial their extension. Although this is a fairly common feature in phone systems these days, it is still a valuable tool in increasing efficiency. When agents have access to all the above-mentioned tools, they are better-equipped to get help when required. This is actually helpful in improving inter-departmental collaboration. It is easy to add a colleague or a manager to an existing call for them to resolve tough issues instead of transferring the call. If a call transfer must be done, they can also prepare an agent about the issues of the caller, prior to the call transfer. It is possible for the call centre agents to have the information of a caller on their computer monitor prior to taking a call with the help of real-time updates and CTI. 5. Call redirection automatically reroutes calls received on one phone to another. For example, you could redirect calls received at the office to employees who work from home, or to salespeople visiting clients, ensuring that calls from potential customers are answered. 6. Conference calling allows you to work collaboratively when businesses or colleagues are on different sites. It lets you conduct telephone calls involving more than two people – a useful way of coordinating work on projects involving different teams or businesses. 7. Call logging is used to record the number, timing, and duration of calls made from each extension. This helps ensure that your phone system is used appropriately. You can use call logging to monitor productivity in departments where phone calls are a core business activity, such as customer service or sales departments. Today’s workforce is more mobile than ever before, so it has become business-critical to enable on-the-go associates to communicate as effectively from the road as they can from their desk. There are several different “find me / follow me” features, such as the Anywhere feature – also known as twinning – that enables users to receive calls on the mobile device and transfer calls seamlessly with the desk phone and place outgoing calls from their mobile devices. This entry was posted in cti, telephony integration. Bookmark the permalink. Why do you need Enterprise Incubation?